Free Data Recovery Software is robust and flexible, portable and malware free solution for lost data recovery. Free Data Recovery Software is developed as free, yet equally powerful as many commercial solutions software to save, and retrieve back once deleted and lost data. With Free Data Recovery Software you can get your data back into the original state - never assume the data you deleted once long time ago is inevitably lost. Try to run Free Data Recovery Software on your hard drive and you may be pleasantly surprised! Free Data Recovery Software is portable, doesn't require installation and can be run from USB stick, SD card or any removable memory device. Simple usage, scan a drive, choose files from the found lost data structure and recover them to a safe place. With Free Data Recovery Software you can get your lost data back, you can recover files and folders that you have previously deleted, intentionally or unintentionally and now you want them recovered to its original state. Free Data Recovery Software can retrieve files that were deleted, emptied from Recycle Bin, shift-deleted (done to avoid putting deleted content in Recycle Bin), quick formatted or full formatted. It can recover files that were deleted through Lan network or intranet or through a host application. 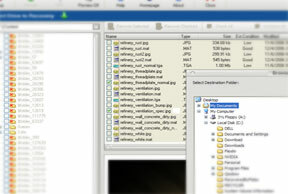 In some cases Free Data Recovery Software will be able to bring back files deleted by specialized shredding programs used for permanent data deletion, depending on the quality of those programs (some of them are verging on the edge of being fake and can not be categorized as true file shredders). How successful fdrs is in getting those files back? The most important thing to remember is that the more time had passed since you deleted files you want now to recover the less chance of their successful recovery. That is particularly true if you did a lot of copying, moving, deleting or downloading since the files in question were deleted. Once you delete a file from your system it isn't actually deleted - the file is still there, sitting on your hard drive, intact. You only deleted the pointer to that file, basically telling Windows that file is not in use anymore and that it is ok to overwrite it. So, As you continue to add new file and move them around the chances Windows will overwrite your precious deleted data grows. It happens in a quite random manner so there might be good chance your file still can be saved by Free Data Recovery Software - you just have to scan a hard drive and try it. Theoretically, you could recover file that were deleted years ago, providing that you haven't use a drive much actively during that time. Second, and very important thing to mention is something called Data Fragmentation. You have probably heard of disk defragmentation and many of you regularly defragment their hard drives. Data Fragmentation is an optimization method in which data is repositioned and sorted on a hard drive surface in a more uniform way, allowing your drive to access the data faster and theoretically, extends the life of a mechanical memory device, such a hard drive is. For Free Data Recovery Software to yield the best result a data should be nicely defragmented at a time you have deleted a files you now want recovered, but the defragmentation should not (or to say, must not) be performed anywhere from the time of data deletion to the point where you run the Free Data Recovery Software in an attempt to recover files. This is very important to understand because Free Data Recovery Software will likely be unable to recover much of a lost data if defragmentation had been run on a device, or a partition you now want to recover files from.